Cloud computing and hosting has revolutionized the way in which businesses (small and large) conduct their operations. While the cloud environment allows users to easily scale their websites, there are additional concerns with disaster recovery. Since this type of hosting service is drastically different from the traditional shared or dedicated hosting options, there must be more diverse ways to protect vital data. Data Replication is a concept that everyone in the IT industry should be well versed in. It happens when data is duplicated from one system to another. Essentially, any changes to the current data on a server are automatically replicated on another machine or portion of the cloud. While this might result in the loss of some data in case of any immediate failure, most of the data will remain in the place. Depending on the replication system being utilized, a server might replicate to multiple physical locations. In the event of a failure at one replicated location, another could be used to restore services, in the event of a disaster. When consistency and data is important, many businesses will essentially outsource their disaster recovery to their managed service provider. Many hosting services will offer a well planned level of services, but this comes with an additional cost. When this type of disaster recovery plan is being employed, it is essential to have a reliable Service Level Agreement (SLA). It ensures that an appropriate level measure of service is offered to maintain a good quality of service. 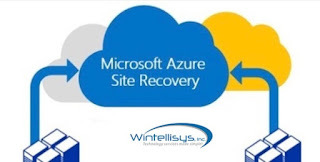 Many websites will have Azure site recovery or backup plan. This allows for an easy recovery or backup option, you can store your data directly to the cloud and can easily access from wherever you want. While backing up data is relatively cost effective in this instance, restoring it can be very time consuming. Depending on the amount of data, the depending process can take minutes or hours. These are some of the ways to protect your crucial data, but have you ever thought, why including a disaster recovery is must for your business? Well, we have the answer to your all questions. Hosting a server on the cloud has many benefits. The ease of use, scalability, and affordable pricing model has made the IT world adapt their disaster recovery options rapidly. If you also want to secure your crucial documents, having a cloud disaster recovery plan is the best bet. Wintellisys ensure you to provide the best cloud backup, recovery strategy that involves the maintaining copies of electronic records in a cloud computing environment as a security measure.